Lancaster Suites II is A Condominium Hotel that’s 5 Min. away from Shaw Boulevard. Lancaster Suites Manila Atrium Tower II Shaw Boulevard, a mere 5 mins walk from Ortigas Center offering Studio, One, Two & Three Bedroom Condo units. - 20% Downpayment, payable over 6 months, 45% payable from present mo. until Dec. 31, 2008, 35% payable on December 31, 2009. Lancaster Manila Atrium Tower A, Shaw Boulevard, Metro Manila, Philippines is a \"Full Service\" Condominium Hotel [\"Condotel\"] offering Studio, One, Two and Three Bedroom Suites for sale with option of enrolling their units in the Lancaster Hotel Rental Pool. Great Investment for Fil-Am\'s whom visit Manila for Vacations or Business as they can earn Rental Incomes [at current purchase levels] of some 12-14% ROI per annum as Owner Non-Residents when not using their units through Condotel Management and reciprocal arrangement with Lancaster Cebu Resort Residences. 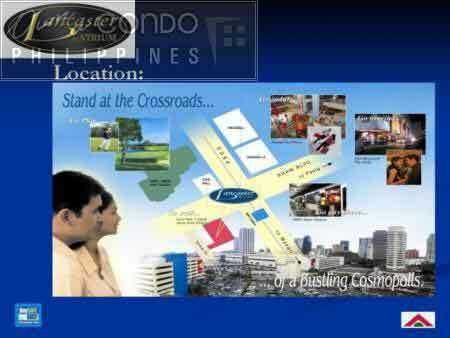 This makes Lancaster Suites one of the Hottest Investment Opportunities in the Philippines. Units at the Lancaster Suites have basic kitchen facilities. The standard unit price [Semi Fitted Suites] provides for the suite to be semi-finished but not fully furnished or fitted. Included in the current standard basic price for the Semi-Fitted units are the interior finishings such as tiled & fitted bathrooms, bedrooms with simulated wood plank flooring, semi-fitted living and dining area tiled floorings and lower kitchen cabinets/work tops installed. Ceilings and walls are painted cement finish. A complete Condotel Suite optional extra interior fit-out package including unit fixtures and fittings, furniture, furnishings, light fittings and fixtures and appliances including air-conditioning will be available towards the time the units are closer to being completed. Monthly condo dues are currently around 80 pesos/square meter of the unit floor area/month.